What do you mean you can't name the glowing eyed, very blue hero of Rogue Trooper Redux? Is he a giant Smurf on protein shakes? A military cousin of Dr Manhattan? The product of an unfortunate accident from Willy Wonka's chocolate factory? Well no, not exactly. 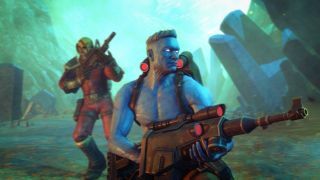 If you missed it the first time around back in 2006, this is a remaster of the original Rogue Trooper, hence Redux. Here’s a quick primer on the antics of the exceptionally blue hero - no, seriously, I’d invest in Dulux if they added his skin tone to their catalogue - and why you should be excited about him being unleashed on consoles later this year. Rogue Trooper was originally a 2000AD comic strip from Gerry Finley-Day and legendary Watchmen artist Dave Gibbons. Not so coincidentally, Oxford-based studio Rebellion owns 2000AD and transformed the series into pixels for PS2, Xbox and PC 11 years ago. The game was so successful that a Wii version, The Quartz Zone Massacre was released three years later in 2009. Yep, now you're interested. When your poor comrades fall to the bullets of your enemies, Rogue has a matter of seconds to pull their personality chip out from the back of their neck and add it to his weaponry. "Don't worry," Rogue growls without a glimmer of a smile. "We're Genetic Infantry, even when we're dead, we don't escape from war." Deep. While we all love our friends dearly, having them live on in your accessories might just be a bit much. Clearly not if you're huge and blue. In the best/worse cases of nominative determinism since Usain Bolt, Gunnar makes your, well, gun sentient, Bagman takes over your backpack, and Helm fixes himself onto your hat. If that sounds like things are going to get a little noisy, they are. Gunnar chats away furiously as you set your sights on enemies and lends a hand when it comes to auto-targeting. Equally usefully, Bagman lets you choose which kind of ammo you'd like to make out of the salvage you collect as you progress. Even in the short demo I play, it's an equally fun and ridiculous premise as Gunnar roars with each headshot and answers the eternal raging argument over who needs real friends when you've got talking weaponry? So yeah, things have changed a bit since 2006 and thankfully Redux recognises that. The visuals have had a serious upgrade with a complete remodelling of assets, dynamic lighting and, wait for it, enhanced geometry but the control system has been upgraded fully, the cover system is now intuitive and some new difficulty settings have been thrown in. It's interesting jumping in to play as it's immediately apparent that this is an older game made much prettier but everything feels intuitive and there's a nostalgic joy in exploring the slightly too big environments with your weaponised pals in tow. Those aforementioned modernised controls are exceptionally welcome when it comes to running and gunning down Norts. Whether he's jumping behind cover, blind firing over his head or throwing grenades, Rogue feels slick to control and thankfully isn't like a blue version of the Incredible Hulk when it comes to steering. Sniper shots to heads are satisfyingly precise and there's just enough chaos on Nu-Earth as you toss grenades or hit gas canisters on enemies to make you feel like you're constantly on the edge of death. Speaking of, there's med packs to refill when things get hairy. Turns out that even genetically engineered super soldiers need the odd first aid pack crafted from salvage. Irritating but having a friend inside your backpack to make them for you is a distinct bonus. And even better? As well as PS4, Xbox One and PC, Redux is on its way to Nintendo Switch later this year. While the Switch currently has an impressive line up of first party titles - it’s ok to admit that you just bought it for Breath of the Wild- it's nice to see multi-platform releases like Redux just casually adding Nintendo's latest to the roster. Handheld is an ideal way to take in the ridiculous gunplay of Redux and I saw it looking rather lovely in action on the console at E3. Plus, given that third-person shooters on Switch aren't exactly in plentiful supply and Redux has a promising 13 missions of nostalgic fun, there's definitely a lot of potential in picking up Rogue and co's adventures for on the go. It's a look back to a brilliant age of gaming that fits just perfectly on that crisp HD screen.